The power factor (PF) of a device is a number between zero and one that represents the ratio between the real power in watts and the apparent power in Volt-Ampere (VA). A power supply that has a PF of 1.0 indicates that the voltage and current peak together (the voltage and current sine waves are always the same polarity). This means that the VA and watt values are the same. A device with a Power Factor of 0.5 would have a watt value that is half the VA value. For example, a 400VA device with a Power Factor of 0.5 would be a 200W device. 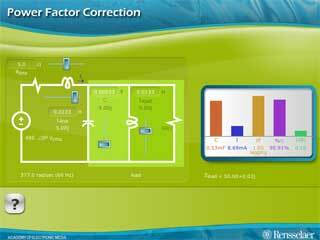 A common misconception is that the power factor and the power supply efficiency are related, but this isn’t true. Power supply efficiency is the ratio of output power in watts to input power in watts at peak efficiency. For example, a typical white box power supply with a peak efficiency of 75 percent would waste at least 25 percent of the incoming energy by converting it to heat that must then be dissipated. On the other hand, devices with a low power factor, don’t waste energy. Unused energy is simply returned to the utility and is not paid for by the customer. Utilities charge for true power used as measured in kWhours, not in VA. The main costs associated with a low power factor are for higher amperage circuits to deliver the same amount of true power as a device with a power factor closer to one. A problem with the combination of a “double conversion” UPS and a generator is the voltage distortion created by the UPS. The input of a double conversion UPS is, for the most part, a large rectifier. The current drawn by the UPS is non-sinusoidal, which can cause the voltage from the AC mains or a generator to also become non-sinusoidal. The voltage distortion can then cause problem in all electrical equipment connected to that power source, including the UPS itself. It will also cause more power to be lost in the wiring supplying power to the UPS due to the spikes in current flow. The level of “noise” is measured as a percentage of “Total Harmonic Distortion of the current” (THD(i)). Classic UPS rectifiers have a THD(i) level of around 25-30%. To reduce voltage distortion, this requires heavier mains wiring or generators more than twice as large as the UPS. Traditional solutions such as passive filters reduce THD(i) to 5-10% at full load. They are reliable, but big and only work at full load, and present their own set of problems when used in tandem with generators. An alternative solution is an active filter, which can drop THD(i) to 5% over the full power range. The newest technology in double conversion UPS units is a rectifier that doesn’t use classic rectifier components (thyristors and diodes), but high frequency components. A double conversion UPS with an IGBT (Insulated-Gate Bipolar Transistor) rectifier and inductor can have a THD(i) as small as 2%. This completely eliminates the need to oversize the generator and transformers without additional filters, investment cost, losses or space.